My son went grocery shopping today. He went because I do not buy the good stuff. He is right. I will not spend $17 on a jar of cashew butter. It is really good cashew butter by the way. I just think it is funny how many times I took him shopping with me and now that he is shopping for himself, it is like he has never been in a grocery store. I do not like tahini, I like to toast and grind sesame seeds instead. I told him this, but does he listen? No. 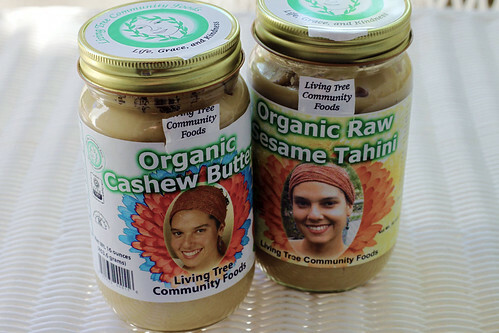 The jar of tahini was $13. Actually I am not upset by the purchases. He needs to learn and all important lessons are costly in some way. It just caught my funny bone when he came home, saying he didn’t realize groceries were so expensive, and I checked the receipt. He hadn’t even looked at the prices. He was just thrilled he could find everything on his list. This entry was posted on Friday, September 11th, 2009 at 3:00 am and is filed under Life. Tagged: Life. You can feed this entry. You can leave a response, or trackback from your own site.